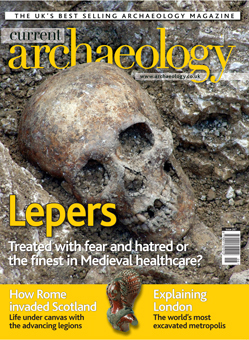 The traditional image of a Medieval leper is a familiar one. Tainted by spiritual pollution, they were outcasts shunned by society. Yet excavations on the site of St Mary Magdalen leper hospital in Winchester are revealing a different picture. Here the afflicted were cared for in substantial structures, before being laid to rest in a carefully ordered cemetery. £200 could buy you a lot of archaeological information in 1939. This was the budget when Croft Andrew set out to excavate at Trevelgue Head. Written up 72 years later, his excavations allow a rare glimpse into life within the ramparts of a Cornish cliff castle. The ancient sources documenting Rome’s Scottish adventures can be vague on the details. Yet temporary camps established to protect campaigning forces overnight provide another testament to the ebb and flow of Roman arms. Careful study and modern excavation are beginning to allow us to link these structures to specific invasions, and tease out life at the sharp end of the Roman world. A cache of metal found in Kent has become the third largest Bronze Age hoard in Britain. More important than its size are its contents. Largely made up of French scrap metal, its discovery has triumphantly validated a longstanding suspicion that a sophisticated recycling network developed to fill the crucibles of British metal smiths. Finally, the countless archaeological trenches accompanying London’s ongoing construction boom has made it the most intensively studied metropolitan area in the world. Drawing these threads together reveals Medieval city life in startling clarity, conjuring a world that is at turns both familiar and impossibly distant. Were lepers reviled as ‘unclean’ outcasts in the Middle Ages? Recent excavations cast doubt on this long-held tradition. The long-overdue story of a Cornish ‘cliff castle’. What £200 could reveal about the Iron Age in 1939. What can new research on temporary military camps tell us about Roman campaigns north of Hadrian’s Wall? PREHISTORIC FRENCH SCRAP DEALERS IN KENT? Forging new connections. A recently-discovered cache of metal objects sheds light on commercial contacts between England and France in the Late Bronze Age? How to make sense of the most intensively archaeologically excavated urban area in the world. Currency archaeology; NPPF: best-laid plans? ; St Andrews’ order of the day; New manoeuvres for Operation Nightingale; Nelson’s Navy nothing new; Normal for Norfolk? ; Skye’s find of note; Roman re-openings.